California sea lions are “eared seals” and can often be seen hauled out, or resting, on shore, buoys, or docks. They have broad fore flippers, a narrow snout and visible external ears. Subadults and adult males have large forehead sagittal crests while adult females and juveniles are more slender bodied and tan in color. Adult males are usually larger than females and more dark and brown in color. Often when hauled out they defend their territories with aggressive physical displays and vocalizations which sound like dog barks and growls. Watch for sea lions hauled out on rocky shorelines, or on platforms like buoys, docks and piers. Listen for their raucous barks as they jostle for position. In the water, sea lions take a few breaths at the surface before diving. Another common behavior is “rafting” where a sea lion holds its flippers above the water to regulate body temperature. California sea lions can be seen at most sites along The Whale Trail. They prefer sandy beaches for breeding and rocky coves for hauling out. They can also be found hauled out on marine docks, jetties, and buoys. California sea lions are native to the North America’s West Coast and live in primarily coastal waters. They range from Alaska to Mexico, with their breeding territories ranging from southern California to central Mexico. The males will migrate to feeding areas in the Pacific Northwest such as Oregon, Washington, and British Columbia, however, the females remain in the breeding areas until the pups are weaned. California sea lions use their fore flippers to propel themselves through the water, and can rotate their hind limbs forward in order to “walk” upon the land. Males will start to develop their sagittal crest around 5 years old and it will be fully developed between 9-10 years old, also the time they become socially mature. Another common behavior exhibited by sea lions is “sailing” or “rafting” where they hold their flippers above the water motionless for a long period of time. This behavior regulates their body temperature. 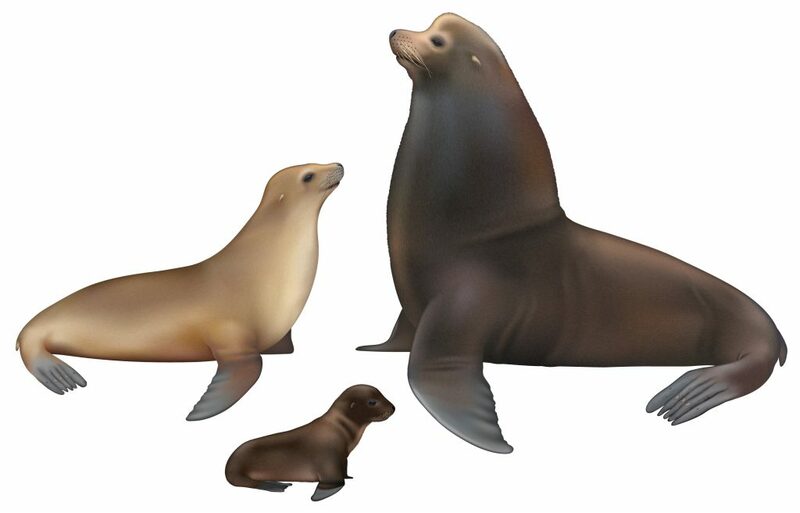 California sea lions become sexually mature at 4-5 years old, but are not socially mature until 9-12 years old. Males are polygamous and have breeding territories that can include up to 14 females. Males will defend their territory with physical displays and vocalizations. California sea lions mate from June to August and pups are born in May through June. Within a month of giving birth, females are ready to mate again. Pups are born dark and will molt the dark coat around 4 to 5 months old and become lighter. Pups are usually weaned by 6 months, although some may nurse for up to one year. Mother and pup sea lions have a special set of vocalizations to communicate that are unique to the particular female and her pup. They also have a unique scent that identifies which pup is hers. Among hundreds of pup vocalizations, a female can locate her pup and does a final smell check to confirm the pup belongs to her. Mother sea lions nurse for 1-2 days, then leaves the pup ashore to head offshore to feed for 2-5 days. If you see a pup on the shore, please leave it be and do not disturb it. If it looks to be in distress, call the nearest marine mammal stranding network. Adult California sea lions are usually solitary, except during the breeding season from May to June. They are social animals in both in the water and on land and can become aggressive while defending territories. Females will fight with other females to protect their pups in the breeding grounds. California sea lion males will bark, sounding like dogs, in order to communicate with other males and females. California sea lions feed mainly in upwelling areas on a variety of prey, including mainly fish. They eat over fifty species of fish such as anchovies, mackerel, and rockfish, as well as squid, octopus and mollusks. California sea lions also take advantage of fishing gear and fish passage facilities at dams and rivers. Similar to all marine mammals, California sea lions are protected under the Marine Mammal Protection Act. Their population has been rebounding since the protection was put in place. It is thought the U.S. stock of California sea lions has been growing, on average, at 6.2% since 1983. In the 1970s, the species’ population was as low as 50,000, decreasing from 250,000-300,000 animals. It is estimated there are around 20,000 in the Pacific Northwest. California sea lions face threats such entanglements, bio-toxins, disease and human caused injuries such as fishing gear and gunshots.